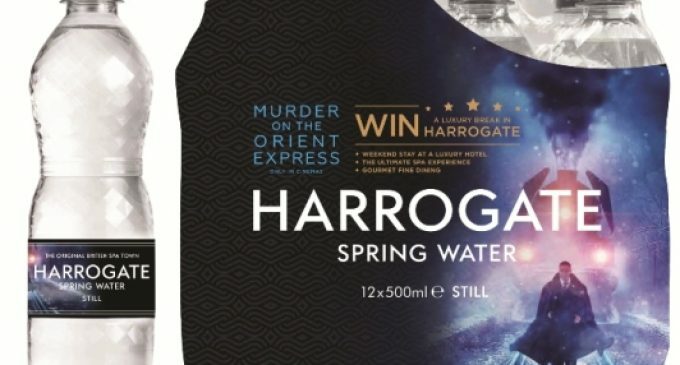 Harrogate Water has launched a promotion with 20th Century Fox to celebrate the new star-studded movie adaptation of Agatha Christie’s Murder on the Orient Express. Harrogate Spring is the official UK water partner for the movie, which is directed by and stars Sir Kenneth Branagh as Belgian detective Hercule Poirot, who needs all his investigative guile after a passenger is murdered on the legendary Paris to Istanbul locomotive. The cast includes Penelope Cruz, Willem Dafoe, Judi Dench, Johnny Depp, Michell Pfeiffer, Daisy Ridley and Josh Gad. The promotion will feature on individual bottles of 500ml still, as well as on multipacks of 12 x 500ml still and 6 x 1l sparkling, with a star prize of a sensational spa break for two in Harrogate. The prize will include a visit to the town’s famous Turkish baths, gourmet dining, £200 spending money and luxury accommodation at Rudding Park Hotel with an ultimate spa experience. Tickets for the movie’s Premiere at the Royal Albert Hall are up for grabs in a separate Harrogate Spring social media promotion. For the new adaptation, Branagh has gone to mercurial lengths to capture the grandeur and opulence for which the legendary train is famous and much of the filming was captured on the move aboard a fully working locomotive on an actual railway line to give the cast the feeling of travelling on the Orient Express. Agatha Christie is the world’s best-selling author, with sales counted not in their millions but hundreds of millions, over 2 billion books sold in 45 languages to be a little more precise. Her whodunnit play The Mousetrap is the longest-running West End play in history with 25,000 performances and counting since 1952. Harrogate town has a particular link to Agatha Christie. Harrogate was the hiding place for Agatha Christie when she famously went missing for 11 days in 1926, sparking one of the biggest ever manhunts, involving thousands of police and making the front page of the New York Times. She was eventually discovered staying under an assumed name at the Old Swan Hotel, Harrogate.